Turkey has called on China to close its detention camps following the reported death of a renowned musician from the ethnic Uighur minority. Abdurehim Heyit is thought to have been serving an eight-year sentence in the Xinjiang region, where up to a million Uighurs are reportedly being detained. A statement from Turkey’s foreign ministry said they were being subjected to “torture” in “concentration camps”. China described the comments as “completely unacceptable”. The Uighurs are a Muslim Turkic-speaking minority based in the north-west Xinjiang region of China, which has come under intense surveillance by Chinese authorities. Their language is close to Turkish and a significant number of Uighurs have fled to Turkey from China in recent years. So far few Muslim-majority countries have joined in public international condemnation of the allegations. Analysts say many fear political and economic retaliation from China. In a statement issued on Saturday, foreign ministry spokesman Hami Aksoy said: “It is no longer a secret that more than a million Uighur Turks exposed to arbitrary arrests are subjected to torture and political brainwashing” in prisons, adding that those not detained were “under great pressure”. “The reintroduction of concentration camps in the 21st century and the systematic assimilation policy of Chinese authorities against the Uighur Turks is a great embarrassment for humanity,” Mr Aksoy said. He also said the reports of Heyit’s death “further strengthened the Turkish public’s reaction to the serious human rights violations in Xinjiang” and called on UN Secretary General Antonio Guterres “to take effective steps to end the human tragedy” there. 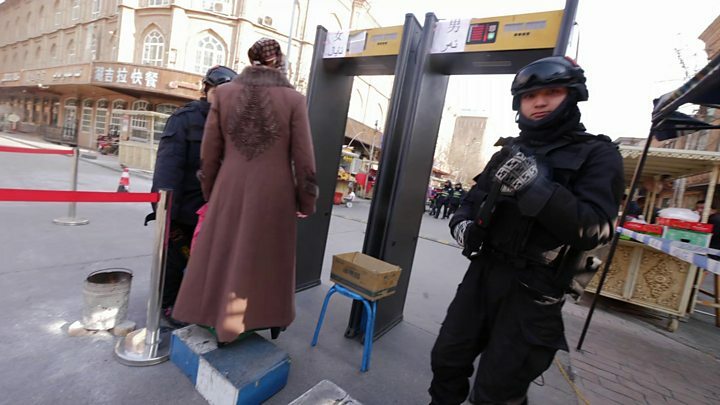 Rights groups say Uighurs, Kazakhs and other Muslim minorities are being detained indefinitely without charge for infractions like refusing to give a DNA sample, speaking in a minority language, or arguing with officials. In a statement quoted by the Associated Press, China through its embassy in Ankara called on Turkey to withdraw its “false accusations”. “Both China and Turkey face the arduous task of fighting terrorism. We are opposed to maintaining double standards on the question of fighting terrorism,” it said. Beijing claims that the detention camps in Xinjiang are “vocational education centres” designed to help rid the region of terrorism. Speaking last October, the top Chinese official in Xinjiang, Shohrat Zakir, said “trainees” in the camps were grateful for the opportunity to “reflect on their mistakes”. What do we know about Heyit’s fate? Amnesty International said it was very concerned about reports of his death, which has not been officially confirmed. Heyit was a celebrated player of the Dutar, a two-stringed instrument that is notoriously hard to master. At one time, he was venerated across China. He studied music in Beijing and later performed with national arts troupes. Heyit’s detention reportedly stemmed from a song he performed titled Fathers. It takes its lyrics from a Uighur poem calling on younger generations to respect the sacrifices of those before them. But three words in the lyrics – “martyrs of war” – apparently led Chinese authorities to conclude that Heyit presented a terrorist threat. The Uighurs make up about 45% of the population in Xinjiang. They see themselves as culturally and ethnically close to Central Asian nations. In recent decades, large numbers of Han Chinese (China’s ethnic majority) have migrated to Xinjiang, and the Uighurs feel their culture and livelihoods are under threat. Xinjiang is officially designated as an autonomous region within China, like Tibet to its south.